Solar energy is energy from the sun- that can come in the form of thermal (heat) and electromagnetic (light) energy! 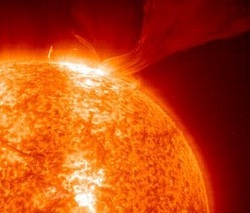 Since energy cannot be created or destroyed, solar energy can be changed to electricity, or what powers things such as lights, computers, and televisions. This change is done through devices called solar panels. Solar is the one of the types of energy called 'alternative energy', which means it is different and healthier for the Earth than normal ways of getting electricity. Traditional v. Solar- Why Use It? - Often transported all the way across the country! Solar panels can be used for everyday things! For example, the panels and the energy captured with these panels can heat water, provide electricity for daily usage, or be used to create solar-powered boats or cars (yes, those exist). These panels can be installed on any large, flat surface. Panels can be installed at school, in a desert (as shown below), on a boat or car, and even on your own rooftop. Next time you're walking out in the neighborhood, look for houses with solar panels installed! Fun Fact: Many research labs in Antarctica have solar panels to power their facilities. The solar panel used in calculation refers to a 1,000 watt photovoltaic cell. Ready to Show Us What You've Learned? Don't need to turn in the worksheet? Please let us know what you have learned digitally by taking the survey version below!